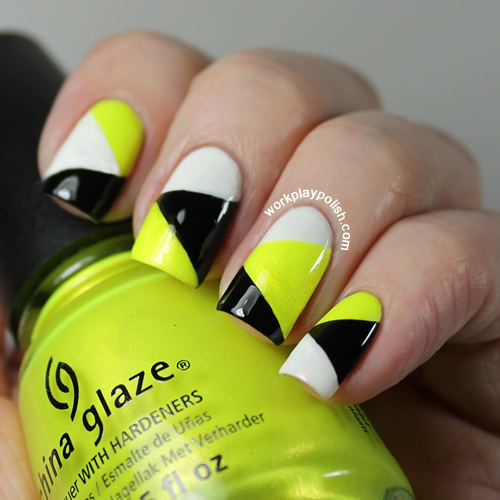 This is the second time in three days that I've posted a black/white/neon mani. Whenever I have time to try stuff out (on the weekends)...I immediately go in the complete opposite direction of work/age appropriate. For this mani, I followed Erika's Patchwork tutorial on Chloe's Nails. She's a genius with the tape manis. I started with white, then the neon yellow and then the black. I used Seche Vite and waited about 15 minutes between steps with no issues. My go-to black/white is OPI Alpine Snow and Essie Licorice. 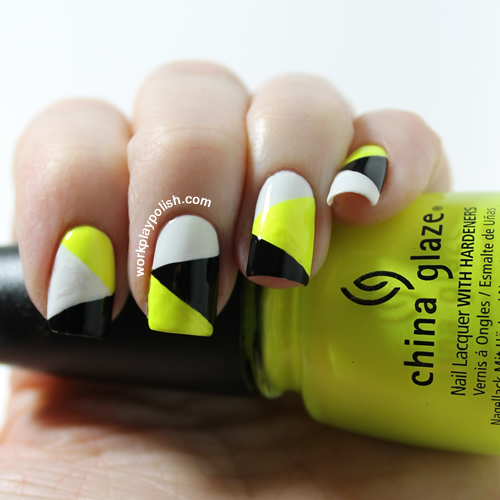 The yellow is Sun Kissed from the China Glaze 2012 Summer Neons Collection. This mani reminds me of the road construction crews by my house who seem to be working on the exact same spot...for two years!